Modern design trends are able to bring more harmony and comfort to home life, allowing you to abandon the traditional classical styles. A modern-style kitchen is a whole series of rules, ranging from design to the final design. Here the importance is given to practicality and maximum functionality. Thanks to the updated finish, it is possible to deviate from the declared patterns, preferring bright colors and original stylistic solutions. The modern style of kitchen space provides for the clarity of lines, non-standard decor and, of course, minimalism. Space zoning makes the room more orderly and easy to use. Each zone has its own purpose, and all the necessary things are at hand. If we talk specifically about the kitchen, then it is important to allocate a place for cooking, the other part of the room should be occupied by the dining area. Furniture. With the help of various pieces of furniture can clearly indicate the purpose of each individual zone. This way of sharing space is the easiest and most accessible to everyone. Ceiling. With the right approach, you can enhance the perception of different parts of the room. In this case, often used multi-level ceilings from drywall. Popular and stretch ceiling systems, divided into parts or tiers. Floors where different decorative coatings are applied. This may be tile, supplemented with linoleum or laminate. Wall. This method of zoning, as in the case of the floor, involves the use of different materials. The line between them will mark the border of a particular zone. Decorative items that are relevant to spacious spaces. Here, the bar counter, decorative niche or shelving with shelves is taken as a basis. A modern-style kitchen is simply unthinkable without convenient and practical equipment, when furniture can perform several functions at the same time, and the equipment “reacts” to sensory and voice commands. The internal filling of the cabinets becomes more spacious, the sliding elements give special comfort. In the updated interior there is no place for bulky sofas, as well as an abundance of household appliances. 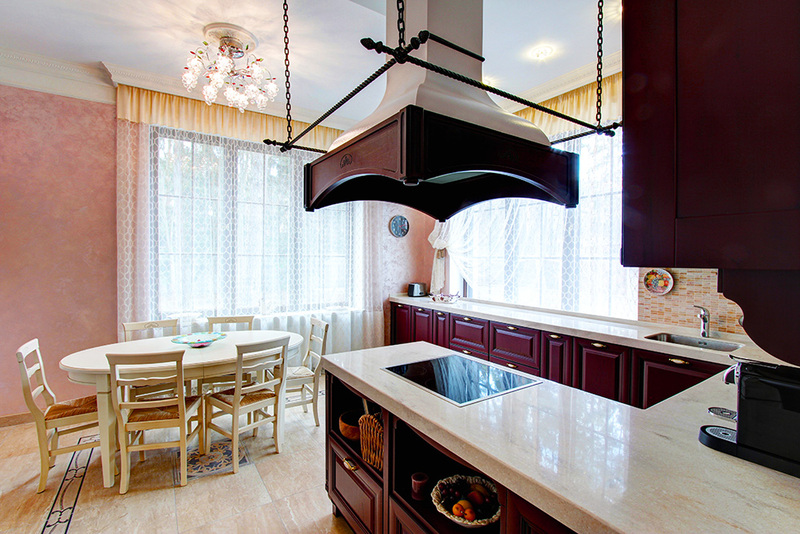 Now, a modern kitchen is a comfortable corner, where you can not only cook food, but also retire, relax and even work.